There’s something fascinating and magical with tiny houses and dolls. Every little girl can spend countless hours playing with a dollhouse and getting lost in her own, pint-sized world. Featuring an adorable dollhouse-themed party for little Aria means there are a lot of darling details to swoon over. And with Event coordinator extraordinaire Ernest Pascual of Bespoke Manila and famed stylist Gideon Hermosa at the helm, this classy fete is one for the books! Everything about the celebration was classy, chic, and whimsical, all perfectly captured by Happy Folks Studio. 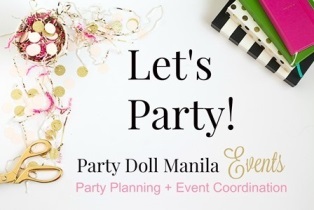 Take a peek at what’s in store for us in this pink-colored, playhouse party! Party guests received charming pastel-hued invites. They also handed out different tickets for the day’s game booths and activities. To spruce up the party venue, decorative floral branches, white curtains, and balloons greeted Aria’s guests as they entered. Take a step back to see the dreamy ceiling décor of aqua blue drapes and white balloons that mimic the sky. It went oh-so well with the white curtained background, giving an airy vibe to the party. The stage was indeed set for Aria’s first fete! A huge dollhouse frame with drawn-on furniture turned into an awesome backdrop, while façade cutouts flanked it. We absolutely loved how the light pink foliage and greenery added extra flair to the whole set-up. In true Gideon Hermosa fashion, lovely blooms in lush, pastel colors adorned every table. Roses and carnations in pink hues had us falling head over heels in love with the chic centerpieces. We’re going gaga over those tiny white dollhouses on tables. See how one was daintily lit up with candles. Plaid runners in pink and white folding lawn chairs made guests feel they’re having a picnic. Of course, the kids were very comfortable as they were seated around smaller-sized tables and chairs. Creative confectioner Sugarplum Pastries didn’t hold back and whipped up something playful in line with the dollhouse theme. Little Aria had two scrumptious cakes – so beautifully made you’ll forget they’re edible! Done mostly in pink, the colorful cakes were absolute scene-stealers! The pastel-popping pink dollhouse with aqua blue roof is so whimsical that when you take a peek at the back, you’ll actually see the playhouse’s insides full of tiny furniture pieces. Definitely brilliant! Guests were treated to a bevy of sweets-laden desserts spread. From sugar cookies to candy pops and cupcakes, everything from the kitchen of Sugarplum Pastries was charmingly detailed and lovingly crafted. What’s not to adore with the little teapots, teacups, frilly dresses, and tiny houses? Whoever thought of this milk and cookie combo is so brilliant. We’re so putting this on our list! Friends and family who came to celebrate with little Aria and her family were entertained with so much activities for the young and old alike. There was a show for the kids where they joined and won prizes from the stash. Game booths for the kids and kids at heart had them tossing rings and bean bags, as well as shooting stuff. Some even got creative in designing their own gingerbread houses because there’s no limit to a kid’s imagination. Guests had their fill of lip-smacking snacks of popcorn, nachos, fries, hotdogs, and cotton candy food carts. As tokens for celebrating with Aria, guests took home paper dollhouses filled with snackable goodies of chips and cookies. They even got felt doll keychains to remember the remarkable occasion. Of course, young Aria had her own wall of photos showing her growth as a little bundle of joy. The elegant spot was cozily festooned with fairy lights and adorned with a couch and chair – perfect for having chitchats. Little Aria definitely had loads of fun during her first merrymaking with family and friends. It was a tasteful, playful affair filled with dainty details and charming elements that made the dollhouse-themed fete an eye candy.